Until September 3rd, get a free matching ottoman with the purchase of any 5' Fombag, 6' Fombag, 6' SofaSack, or 7.5' Sofasack. Simply enter coupon code FREEOTT. Limit one per customer. Kick your feet up in style! 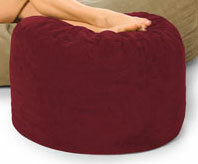 Our Ottoman Foot Rests are made from the same fabrics and quality materials as our full size bags. These are the perfect complement to your Fombag and will make it even more unlikely you'll ever want to get up. Liners (included) are a very strong breathable canvas..